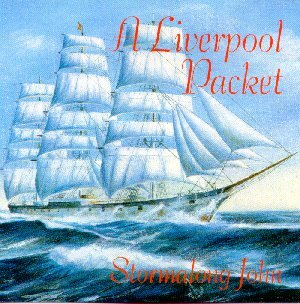 Stormalong John are a Liverpool shanty group, based at the Mersey Maritime Museum. We came together in 1984 for the Tall Ships visit to the Mersey and through various changes of line up have continued to sing at concerts, festivals and maritime events throughout Britain, in Brittany, Germany, The Netherlands, Poland, Denmark, Norway and Sweden. During that time, we sang regularly with our great friend and mentor, the late Stan Hugill, the last English shantyman. The group take our name from Stormalong John - Old Stormy - Mister Stormalong, a mythical figure in sailors' lore, the idealised skipper who treated his crew decently! Whip Jamboree, Liverpool Judies, Sacramento, Lowlands, Roller Bowler, Santiana, Goodbye Fare Thee Well, Clear Away The Track, Essequibo River, Hieland Laddie, Yeller Girls, Haul Away For Rosie, Alabama John Cherokee, The Amphitrite, Fire Marengo, According to the Act, Roll Boys Roll, New York Girls, Strike the Bell, Johnny Come Down To Hilo, Maggie May, Cheerly Man, The Balaena, Paddy Lay Back, Leaving of Liverpool. Where Am I To Go, Girls of Dublin Town, Running Down To Cuba, Old Moke Pickin On A Banjo, Eight Bells, Roll Boys Roll, Pilots of Tiger Bay, Gals Of Chile, Golden Vanitee, Heave Away Boys Heave Away, The Campanero, Jack All Alone, Pull Down Below, Aboard the Kangaroo, Haul Away Boys, The Anglesey. Rio Grande, Pull Down Below, John Cherokee, Swansea Town, Blood Red Roses, 3 Score and Ten, Congo River/Blackball Line, Liverpool Packet, Old Moke, The Kangaroo, Aloue, Blow The Man Down, The Campanero, General Taylor, The Ebenezer, Curracheen/Carls O Dysart, Banks of Newfoundland, A-rovin, Rollin Down To Old Maui, 8 Bells, Haul On The Bowline/Coal Black Rose, Drunken Sailor, Outward and Homeward Bound, Running Down To Cuba, Blow The Man Down. The Smacksman, Roll The Cotton Down, The Whalerman's Lament, Tachuana Girls, Ranzo Ray, Jolly Roving Tar, Farewell to Tarwathie, Lowlands/Emma Let Me Be/ Coal Black Rose, Heave Away Boys, Paddy West, Bold Reilly, We're All Bound To Go, Grimsby Lads, Poor Old Horse, Sam's Gone Away/ Essequibo River, The Coast Of Peru, 23rd March/Bonnie Ship The Diamond, Haul away Joe, Bottle-O/ Fire Down Below, Paddy Doyle's Boots, Roll The Old Chariot, Off To Sea Once More. Arthur Garnett, 55, Twickenham Drive, Huyton, Nr Liverpool, L36 4QG, United Kingdom. Tel +44(0) 151 449 1766. Arthur Garnett. Jack Coutts, 7 Thomas Lane, Liverpool, L14 5NR, United Kingdom. This information was last updated on 23rd February 2000. All rights reserved. Lawyers in suits will be after you if you copy any of this. You have been warned!